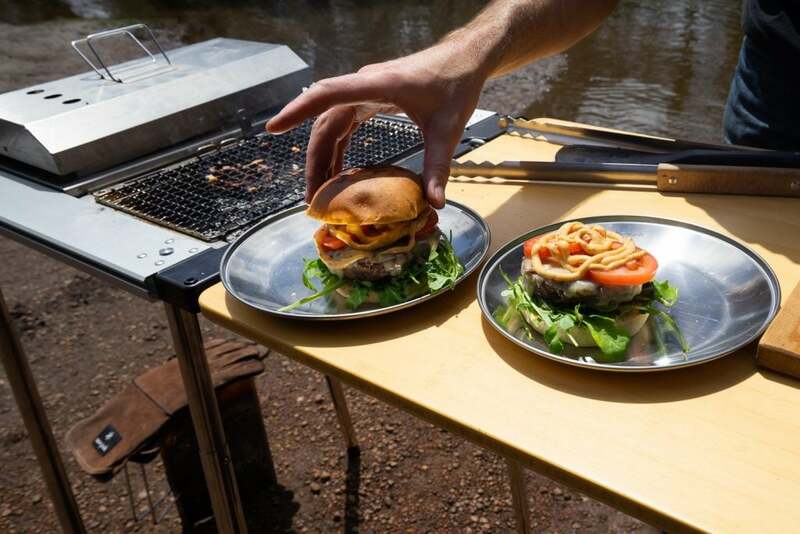 Quick, easy, and delicious char-grilled burgers whilst on the go? Our mouths are watering and yours will be to! We look at taking a quality burger game outdoors. 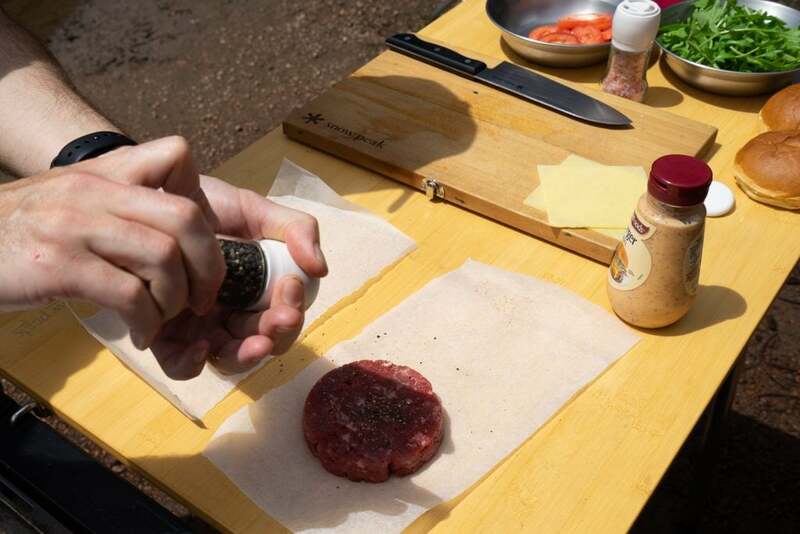 Place your patties on a flat surface, we like baking paper for ease of transferring to the BBQ Box. Load them up with freshly ground salt and pepper to help form a nice crust. When the charcoal has burned to the top of the stack it is ready for use ~20-30 minutes. Be sure to use good quality fire-proof gloves when handling charcoal or fire. 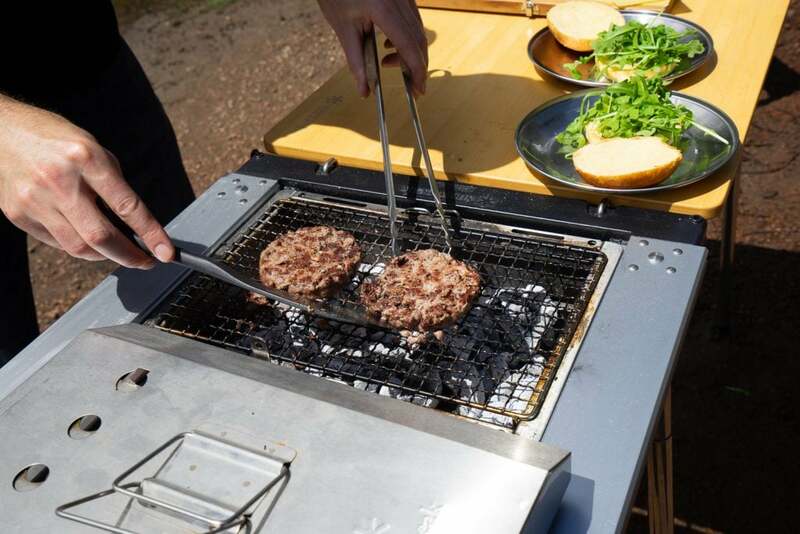 Time to load up the Snow Peak BBQ Box which we have placed in the Snow Peak Iron Grill Table. 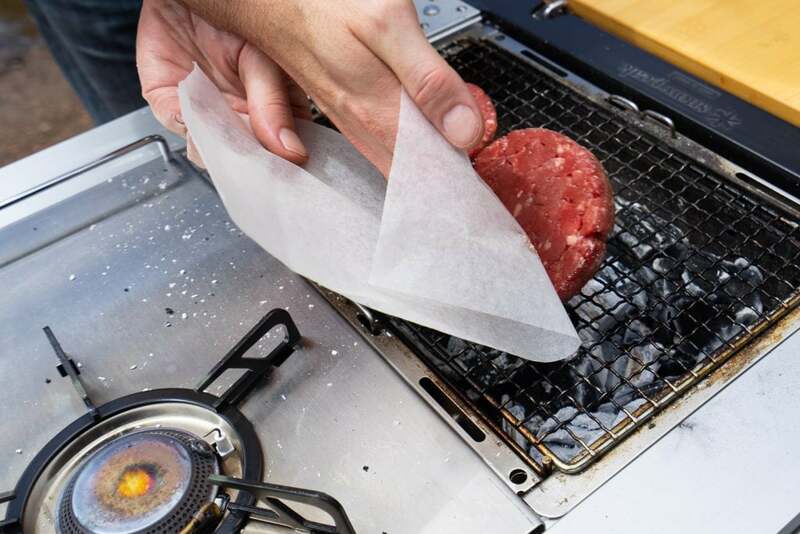 Preparing the patties on baking paper allows for easy transfer to the grill. 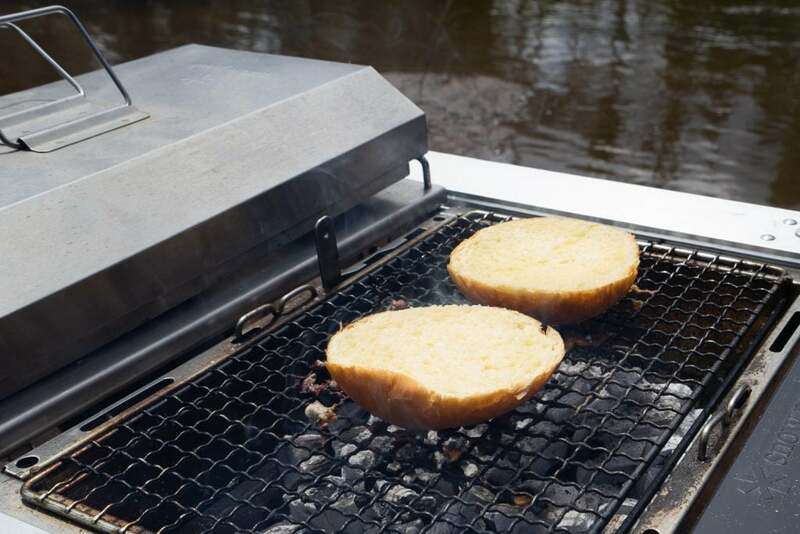 Make sure the grill mesh is nice and hot then flip them on and season the top side with salt and pepper. 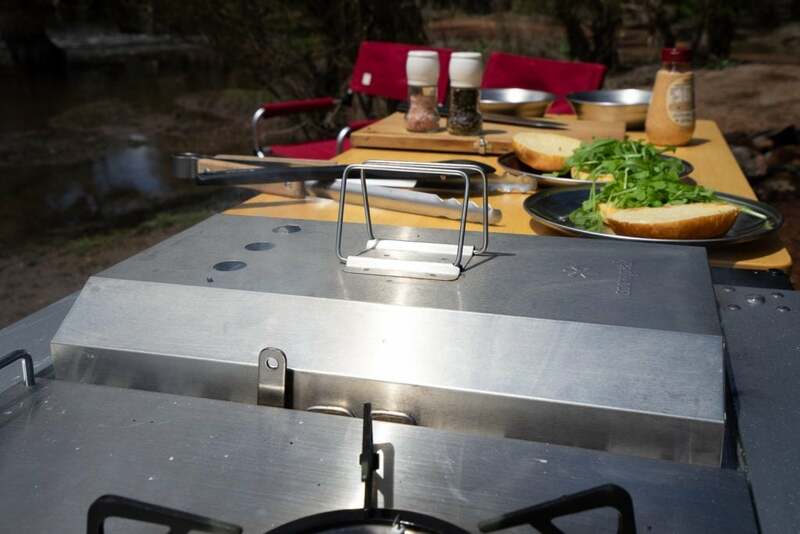 By cooking on a pre-heated grill surface there is less chance of food sticking to the grill. Our patties are home made. 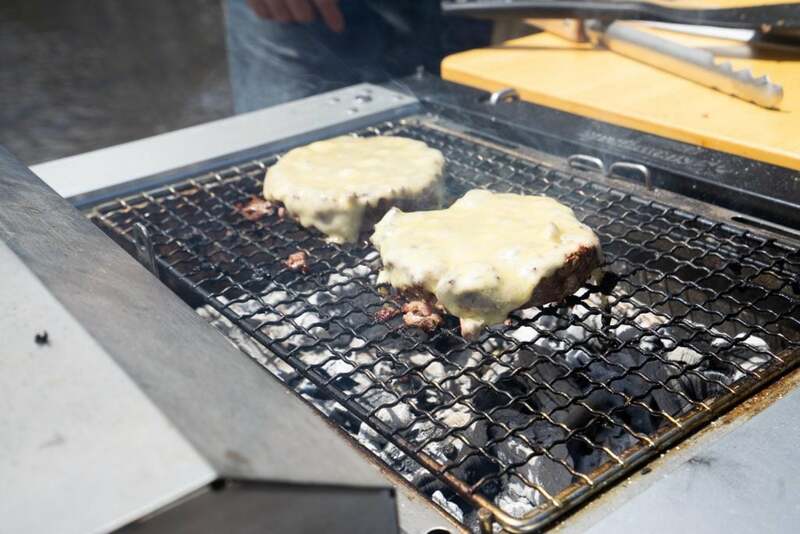 *secret tip: The patty consists of 50% beef brisket and 50% chuck steak, coarsely ground and then refrigerated to keep shape. There are no other ingredients at all! We like our lettuce on the bun first because it helps prevent a soggy burger bun when the meat patty has a bed of lettuce to sit on. Cook the patty on one side, flip it to the other side, use some utensils and be gentle. 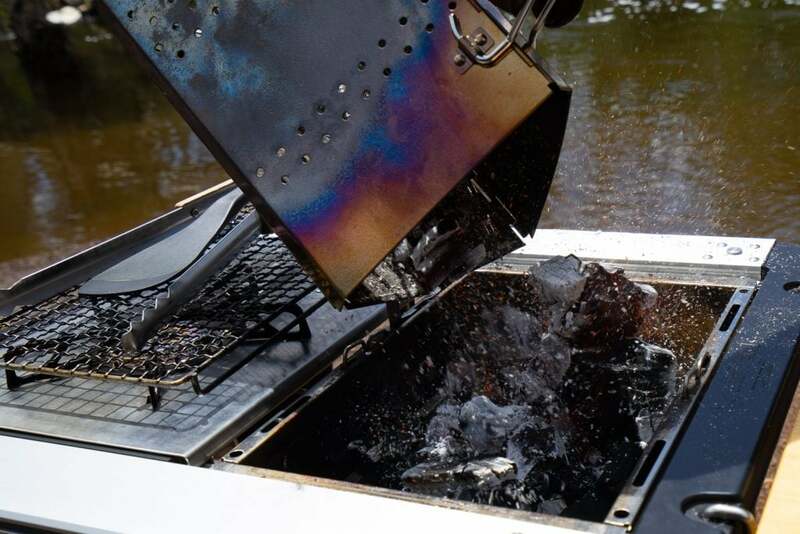 Aim for a nice crusty surface, cook to your liking but be careful, cooking on charcoal can be deceiving, it may cook more quickly than you think! 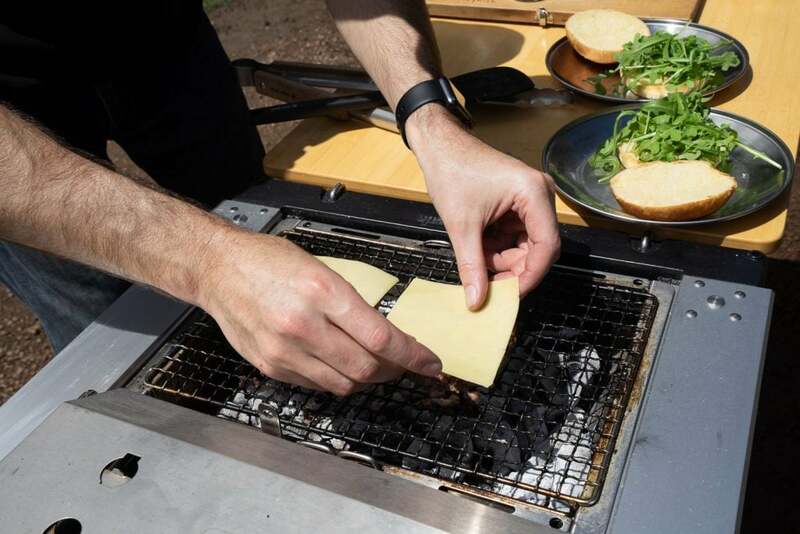 Flip the patty once again and place your favourite cheese slices on each patty then pop the BBQ box lid on for a moment to really melt that cheese slice. 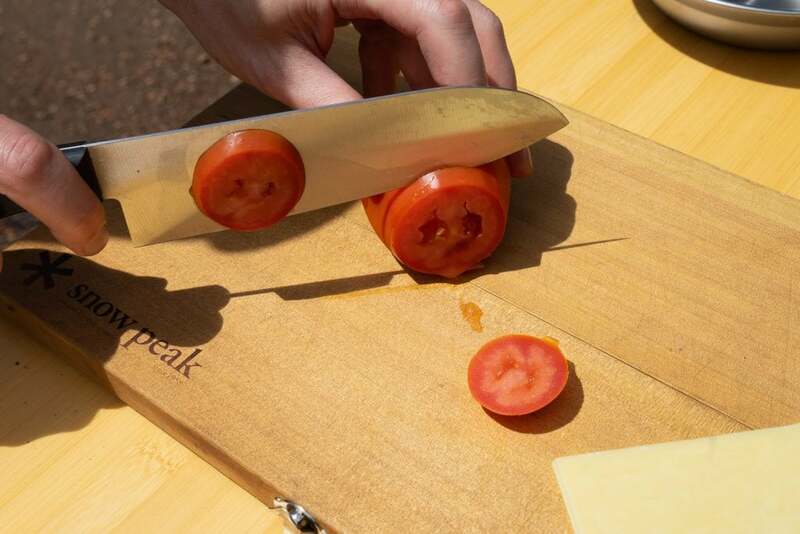 We love that the Snow Peak BBQ Box includes a lid, it’s perfect for this. 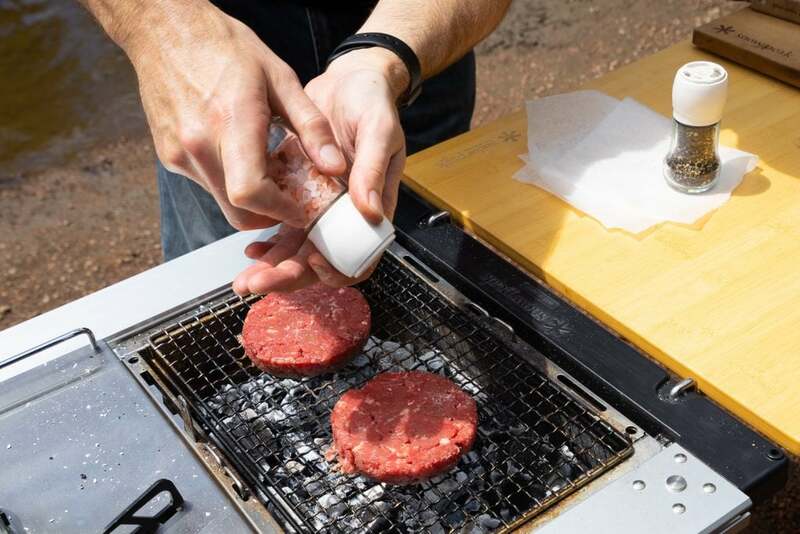 Carefully take the patties from the grill and place them on your lettuce, while you’re stacking the rest of your burger up, optionally give the buns a toast on the grill. Be sure to keep a close eye on them. 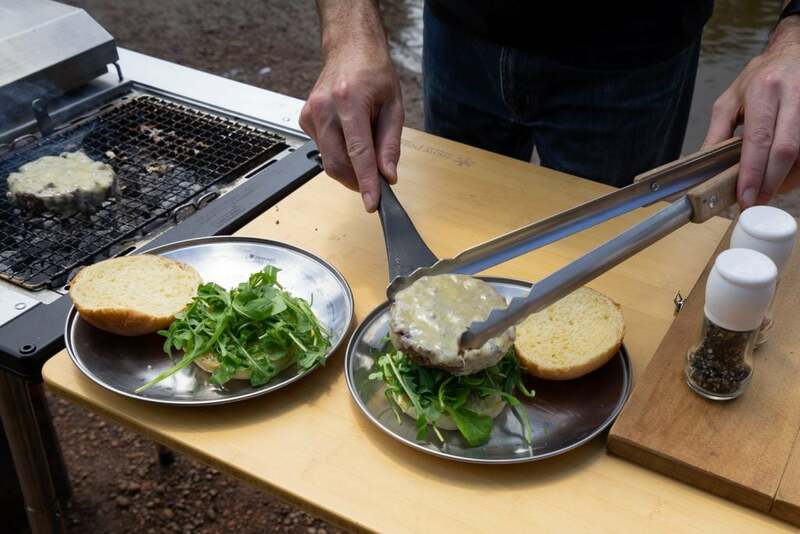 We use a light, but not sweet brioche bun, which doesn’t overpower the burger. With your burger loaded up and your favourite burger sauce applied, finish the masterpiece off with the toasted bun. Burgers are better with beer. We grabbed a nice Session Ale from our local brewer, Otherside. So good! James is an avid traveller and adventurer into four wheel driving, fishing and camping. 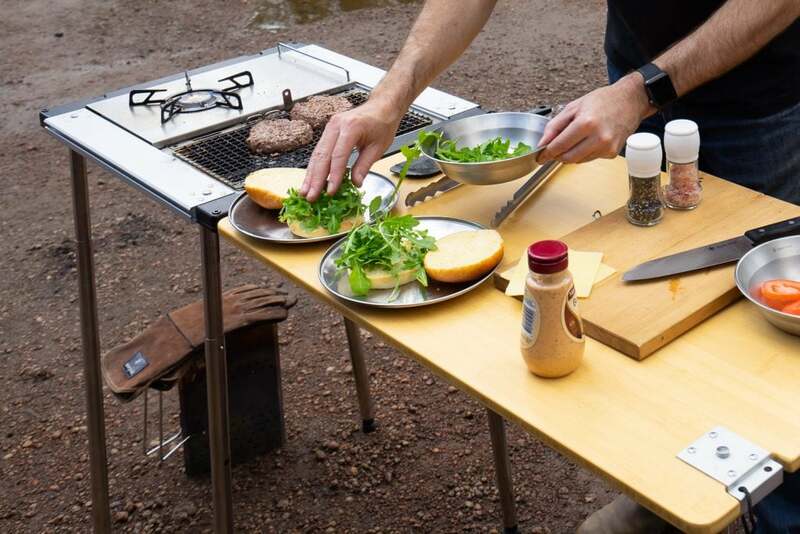 If he’s not out on the trails with his family, he’s at the beach on his stand-up-paddle board or barbecuing. James loves coffee, has experience in planning and coordinating state and national club-style events, and enjoys capturing the moment with photo and video.